Following Brian Michael Bendis’ takeover of DC’s Superman line, the Supergirl ongoing series has been given a new direction courtesy of two of Bendis’ pals, writer Marc Andreyko and artist Kevin Maguire. New villain Rogol Zaar claims he is responsible for the destruction of Supergirl’s (and her cousin’s) home planet of Krypton, and Kara has taken to the stars to learn more about the mass murderer and why he would destroy an entire planet. 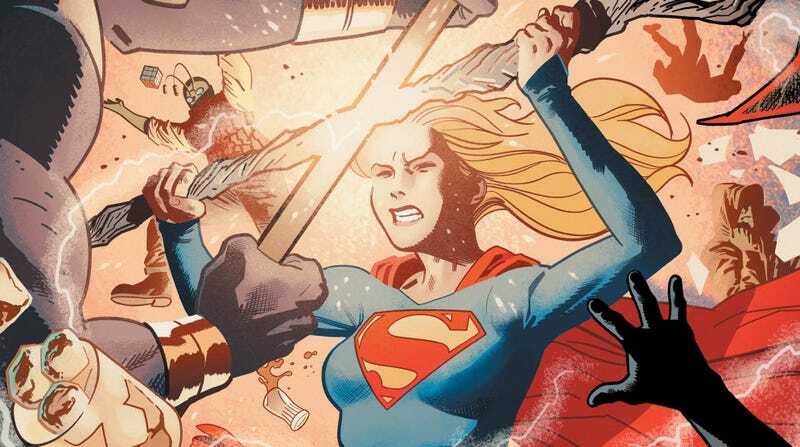 Supergirl is on a cosmic mission of vengeance—a drastic shift from the previous run on this series, which brought Kara down to Earth to explore her relationship with humankind. Now Andreyko is giving readers Supergirl by way of Guardians Of The Galaxy, which becomes especially apparent when Kara meets a Star-Lord-esque new character in this week’s issue. This week’s Supergirl #24 has Maguire taking a break, for a guest issue from artist Evan “Doc” Shaner, who worked with Bendis on an issue of the Man Of Steel miniseries setting up this current Supergirl arc. Shaner and colorist Nathan Fairbairn are one of the best art teams in superhero comics, and this exclusive preview showcases how they maintain the rich expression of Maguire’s work while accentuating the pulp sci-fi atmosphere. This issue puts Kara in an alien bar, and the art team makes the space come alive: Kara’s body language and facial expression reinforce her steely determination, and Shaner’s art highlights Maguire’s alien design talent—particularly for the character of Hakmon, a stout pink alien that looks like it was crafted in Jim Henson’s Creature Shop. Shaner and Fairbairn are only on this book for one issue, but hopefully there will be more Kara and Krypto in their future.